A Book from the Sky by Xu Bing - Xu Bing, a Chinese artist, spent years carving blocks of meaningless symbols that resemble Chinese ideograms. He then created books and scrolls using the symbols. The Chinese government wasn't happy. 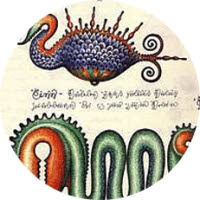 Codex Seraphinianus by Luigi Serafini - Serafini created the Codex Seraphinianus over thirty months in the late 1970s. The book is written in an unintelligible script, and is copiously illustrated. The eleven chapters deal with such subjects as migrating trees, pens grafted onto human bodies, and bizarre games. 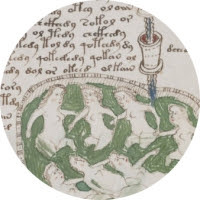 The Voynich manuscript - The Voynich manuscript was written between 1450 and 1520 (unless it's a hoax). The author, script, and language are unknown. Based on the illustrations, the book appears to be divided into six sections, dealing with astronomy, botany, biology, cosmology, pharmaceuticals, and recipes.